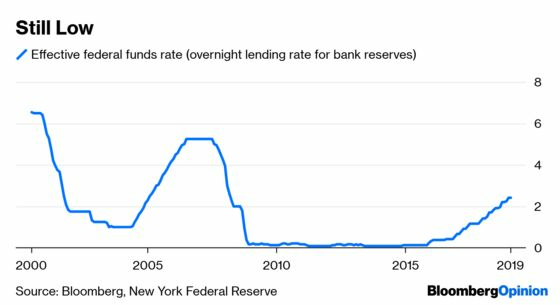 (Bloomberg Opinion) -- Almost 10 years after the Great Recession ended, the growing threat of a new economic slowdown raises a troubling question: When the next recession strikes, what can the world’s central banks do? With interest rates low and their balance sheets still loaded with assets bought to fight the 2008 crisis, do they have the tools to respond? This column is one of six looking at that question. When the next recession comes, will the Federal Reserve have the resources needed to fight it off? The experience of the past decade suggests that people should curb their expectations. The Fed will therefore probably have to resort to unconventional measures. What will they look like? The obvious steps are the things the Fed did during the Great Recession. One, called quantitative easing, involves buying lots of bonds in an attempt to push down long-term interest rates. Another, forward guidance, entails promising to keep interest rates lower for longer after the recession ends. It’s not obvious how effective either of those approaches really is. Many of the central bankers who carried out quantitative easing, such as former Fed chairman Ben Bernanke, think it had a big effect. But other macroeconomists, such as Columbia University’s Michael Woodford, question whether it even managed to push down long-term interest rates, much less affect the real economy. QE is primarily supposed to work through portfolio rebalancing -- reducing interest rates on government bonds makes investors switch to private bonds and stocks, which lowers companies’ cost of capital and prompts them to invest more. Some studies find evidence that this actually happens, others don’t. Forward guidance is flawed, too. It seems unlikely that investors, businesses and consumers really make decisions by thinking about the distant future. On the contrary, theories that assume people are very forward-looking generate strange results, implying that the theories probably are not right. Also, forward guidance has a credibility issue: Who really thinks that the Fed will keep its promise to keep interest rates lower 10 years from now? How could anyone know whether it was even keeping its promise once the 10-year mark arrived? During the period from 2008 through 2013, Bernanke promised several times to keep interest rates low for a long time. Are rates now historically low because the Fed is keeping Bernanke’s promise, or would they have been low anyway? It’s hard to tell. So while the Fed will probably employ both QE and forward guidance in the next recession, it should also be trying to expand its unconventional toolbox. One option is to follow the example of the Bank of Japan. 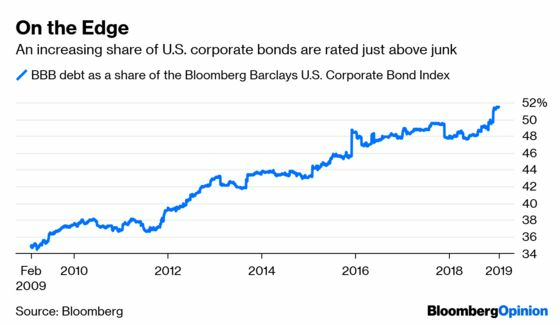 Under Governor Haruhiko Kuroda, the BOJ bought both corporate bonds and shares in Japanese companies, until it owned 3.8 percent of the country’s entire stock market as of May 2018. This troubles many business leaders, who claim that the central bank drove private investors out of markets. The BOJ has since moved away from such asset purchases, though neither BOJ actions nor Japan’s negative nominal interest rates have enabled the economy to hit the country’s 2 percent inflation target. Another approach is to tolerate more inflation. Officials at the Federal Reserve Bank of San Francisco have called for the U.S. central bank to explicitly commit to overshooting its own 2 percent inflation target, so that investors stop perceiving the target as a hard ceiling. Alternatively, it could explicitly raise the inflation target to 4 percent. Knowing that the Fed would accept more inflation might be a credible way of shifting people’s and businesses’ expectations, encouraging them to spend and invest before prices go up. A final approach would be so-called helicopter money: The Fed would distribute money directly to citizens, in the hope that they would spend it. This is akin to fiscal stimulus, but financed by new money creation rather than by federal spending. It’s a radical approach that would probably require legal changes, but some believe it could be powerful. Others worry it could end up unleashing a spiral of inflation. Either way, helicopter money seems likely to be a very last resort, used only in a very large recession like the one that hit a decade ago.